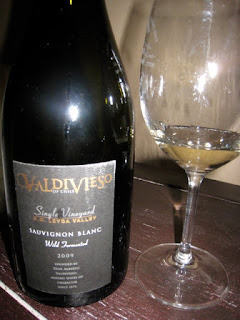 I first tried this single vineyard Sauvignon Blanc from Chile's Ledya Valley in an amazing "blogger tasting" conducted by several amazing vintners from Chile. It was a tasting focused on Chilean Sauvignon Blanc and the many different soils and climates it is made in there. Check out the tasting notes here. The really unique thing about this particular wine is that it's partially aged in oak and is wild fermented. They used 500-liter French oak barrels for a total of 6 months, didn't add any yeasts, nor did it undergo malolactic fermentation. On the nose I get a quite distinct tone of grapefruit, that combines with a pronounced grassiness and minerality. On the palate the wine is slightly viscous in texture but maintains it's high acidity, which is of course quite typical of the varietal and the cooler climate SB's in general. The mineral characteristics translate onto the palate where the wine displays flavors of citrus, kiwi, and a touch of toast. The finish is quite long and powerful and perhaps flaunts a touch of it's 14% by volume! I agree that is was kind of them to send out bottles to re-taste. Did you like the second better? Was it from the same harvest?